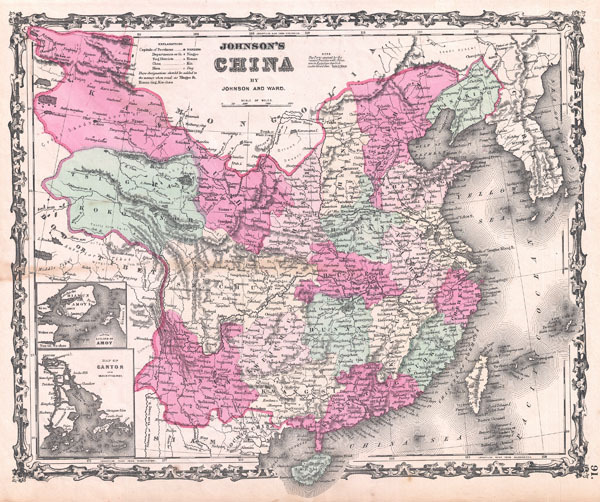 A very nice example of A. J. Johnson's 1862 map of China. Covers China from Tibet and Yunnan east to Korea and north as far as Mongolia. Extends south to include the island of Hainan. Formosa or Taiwan are also included. Insets detail the Harbor and Island of Amoy and Canton with Adjacent Islands (Hong Kong). Features the strapwork style border common to Johnson's atlas work from 1860 to 1863. Published by A. J. Johnson and Ward as plate number 91 in the 1862 edition of Johnson's New Illustrated Family Atlas. This is the first edition of the Family Atlas to bear the Johnson and Ward imprint.